Chicago Creative Space is taking job seekers inside one of the coolest and most rapidly growing tech companies in Chicago! Learn about the Solstice Mobile’s culture on a beacon-based tour of their awesome office, complete with tech demos, refreshments. 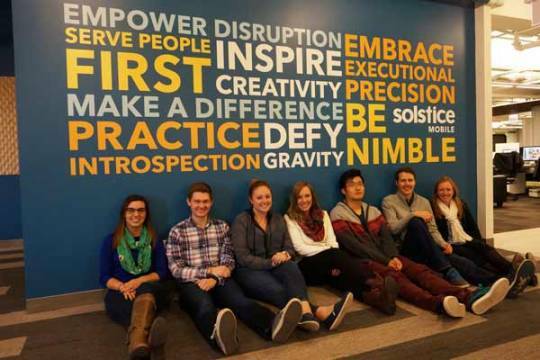 Connect with Solstice recruiters about the many career opportunities available for graduating students, prospective interns and professionals wishing to join an award-winning company and culture. Solstice Mobile empowers disruption by enabling their clients to innovate quickly. They marry innovative strategy with beautiful, human-centered design and precise engineering. They reimagine the customer journey by replacing points of friction with points of delight. They create emotional connections through experiences driven by context and personalization. Together, they are reimagining the way the world does business. Check out their current job openings. CCS Connect is a monthly recruiting event hosted by the award winning Chicago companies looking for tech and creative talent. Tour the coolest offices, experience amazing company cultures and explore career opportunities these great companies. Each month, Chicago Creative Space releases new Creative Space videos that take you inside some of the coolest offices in Chicago. We’ve found that these are effective ways to give students a way of learning about great career options available in Chicago.